Autodesk has revealed more details of its new Stingray game engine, including pricing, an overall feature set, and details of the integration with its other middleware and DCC software. Pitched as a complete out-of-the-box development pipeline for small-to-medium-sized game developers, Stingray will become publicly available on 19 August on a pay-as-you-go basis, starting at $30/month. First announced at GDC 2015 in March, Stingray is based on the in-house engine of Swedish developer Bitsquid, which Autodesk bought last year. At the time, it seemed an intriguing move. Although used on a number of Windows and PlayStation titles, Bitsquid was still a relatively little-known engine. And with Epic Games having just removed the rental fee for Unreal Engine 4, and Unity Technologies announcing a new, more fully featured free edition of Unity 5, Autodesk faced a daunting prospect. It had to launch a new commercial engine against two better-established competitors, both of them free to use. So what has Stingray got that its rivals haven’t? The first key selling point for Stingray, according to Autodesk, is its design. Both UI and core tools are written in HTML5, meaning that all of the key files are human-readable and hand-editable. “It’s got a very modern design,” says Autodesk games industry marketing manager Wesley Adams. “It feels more like a AAA engine in that it’s so customisable and flexible”. Larger firms willing to pay for the C++ source – it is available, but priced on enquiry – will be able to “make their own Stingray builds, customise core engine components and get source access to all Autodesk middleware”. That brings up another key feature of Stingray: it comes with a set of supporing tools, including HumanIK, AI system Navigation, GI lighting solution Beast, and a new UI-authoring system based on Scaleform. It also integrates with PhysX, Nvidia’s open-source physics system, and Autodesk says that it aims to support more of Nvidia’s GameWorks technologies in future. While these kinds of toolsets aren’t unique to Stingray – both Unreal Engine and Unity have their own UI, GI and pathfinding systems – it does give indie studios access to a range of widely used middleware. “It’s a really cool way to bring tools that are used by AAA studios to everybody,” says Adams. Like Unreal and Unity, Stingray supports physically based shading: a workflow demonstrated in the video above. As well as the lightmap baking functionality provided by Beast, Stingray supports “advanced particle effects, post processed visual effects … and a high-performance reflection system”. 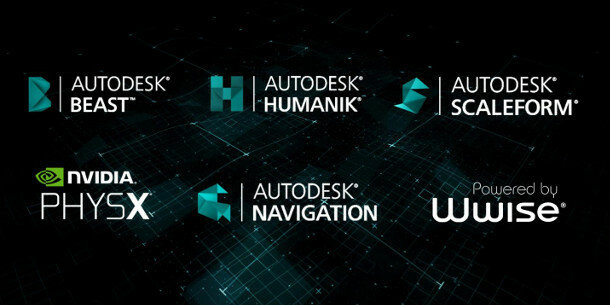 As you might expect, Stingray also integrates closely with Autodesk’s DCC tools, although the firm has been keen to stress that “nothing is locked to 3ds Max or Maya”. “We have had beta users use Stingray in combination with Blender, for example,” commented Autodesk developer Kees Rijnen, original creator of the ShaderFX shader-authoring system included in Stingray. However, if you use Maya LT, Autodesk’s cut-down version of Maya aimed at indie game artists, you do get one important bonus: Stingray will be included free as part of your desktop subscription. That effectively means that Stingray comes with its own – and pretty nifty – 3D modelling and animation system. When it comes to output, Stingray can deploy to “pretty much any device you can connect to by IP”. Changes made in the editor are propogated in real time, giving artists instant in-game feedback. According to Autodesk, the live link extends to geometry, lights, animations and shaders, with Stingray automatically pulling in materials specific to a particular platform. Adams describes this as a key benefit of the engine, noting that “material conversion is a super-painful point. People spend a lot of time trying to rewrite things to look the same across platforms”. In practice, that means that on release, Stingray will deploy to Windows 7 and 8, iOS, Android, Xbox One and PlayStation 4, along with the second-generation Oculus Rift dev kit. Both Unreal Engine and Unity deploy to additional platforms – notably HTML5 – and a wider range of VR hardware, but that’s still the major commercial markets covered out of the box. Stingray also comes with its own equivalent of the Unity Asset Store or UE4 Marketplace, in the shape of Creative Market, the online startup that Autodesk acquired last year. At the minute, most of the content flagged as Stingray-compatible consists of low-poly in-game models, but Autodesk says that more material, including a range of free worked-example games, will be available on launch. On paper, Stingray looks like a pretty strong proposition: lightweight, flexible, and integrated with the DCC software that many developers will already be using. Unlike Unreal Engine – although not Unity – you don’t have to pay royalties once a game is published; and if you’re a Maya LT user, it gives you an engine and a set of middleware tools for free. That alone seems certain to guarantee it uptake, in the same way that many buyers of Autodesk’s Entertainment Creation Suite use Mudbox for sculpting work, rather than paying for separate licences of ZBrush. Whether Stingray can make further inroads into the market will depend on how its functionality and workflow stack up against its rivals at launch, and how Autodesk continues to develop them in future. For its part, Autodesk says that it is “actively continuing to support Unity and Unreal Engine”. But regardless of its eventual market share, Stingray looks to be a significant new player in the games industry, and one that we imagine many developers will be actively evaluating in the coming months. Stingray will be available from 19 August 2015 as a standalone desktop subscription, priced at $30/month or $50/month for advanced support. Quarterly, annual, two-year and three-year packages are also available. It will become part of the Maya LT desktop subscription later this summer. The editor is Windows-only.